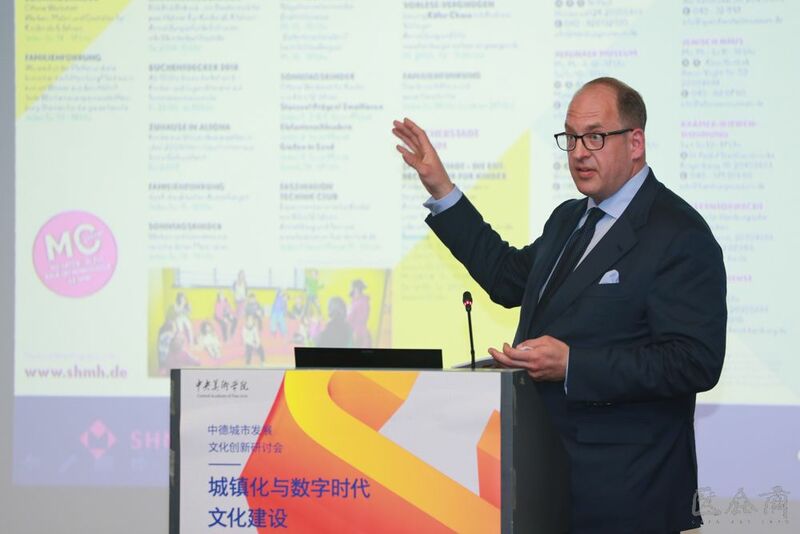 On the morning of April 26th, as a crucial academic activity, the Sino-German Urban Development & Cultural Innovation Seminar was co-sponsored by China Central Academy of Fine Arts (CAFA) and China Academy of Urban Planning & Design. 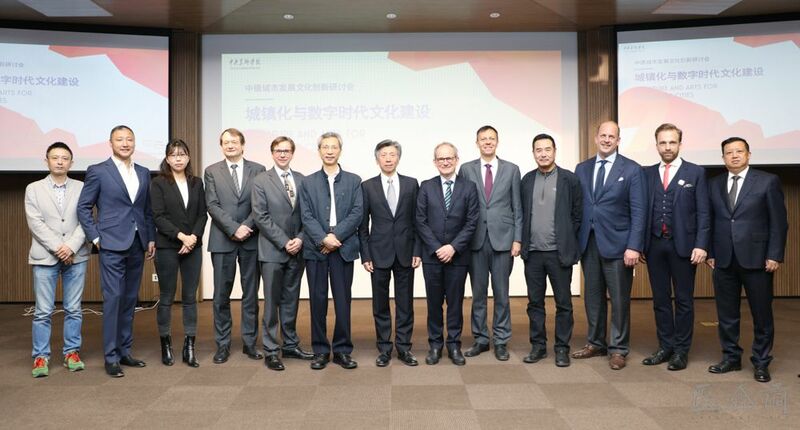 This seminar invited twelve experts and scholars from China and Germany. 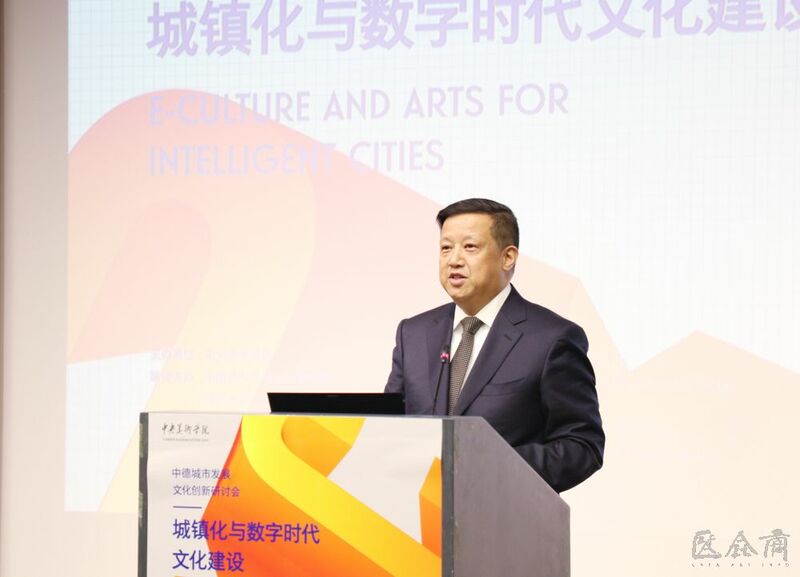 With the topic of “E-Culture and Arts for Intelligent Cities”, scholars came together to discuss issues on the process of urbanization, as well as the administration of cultural innovation in the digital era. 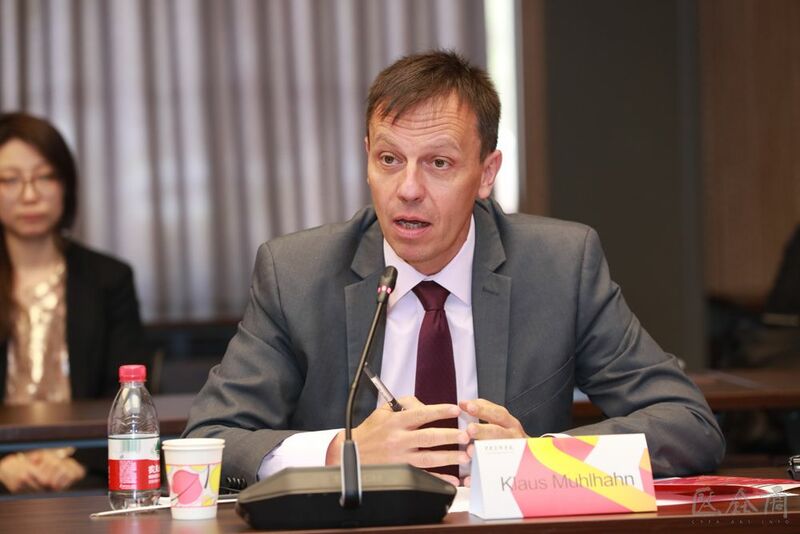 The seminar was divided into three parts, including two lectures and one round-table discussion. 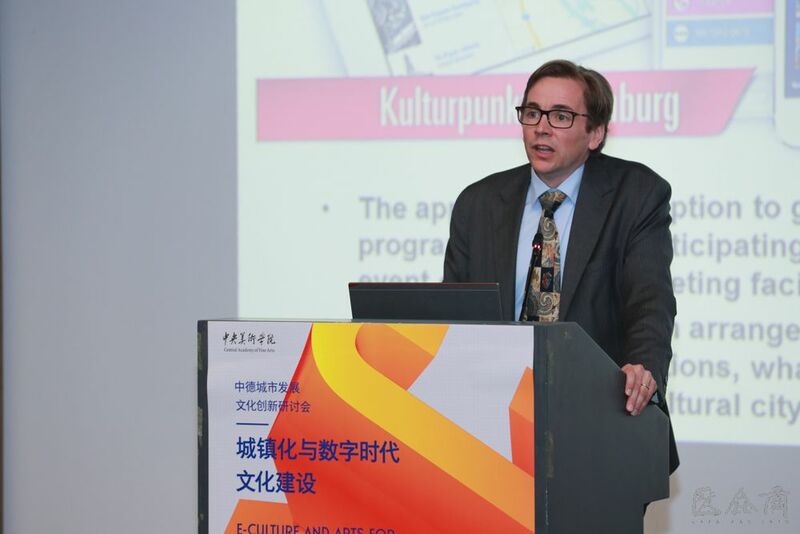 The seminar was conducted in three groups, the German expert group led by Dirk Petrat, Central Services, Ministry of Culture, Hamburg in Germany, the urban designers’ group led by Yang Baojun, the Director of China Academy of Urban Planning & Design, and the CAFA expert group led by Fan Di’an, the Director of CAFA. 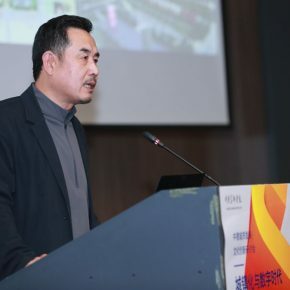 In the hope of reviewing the development of current urban innovation, and introducing a new perspective in the field of disciplinary research, the conference was hosted by Yu Ding, the Director of the Department of Art Administration and Education at CAFA. 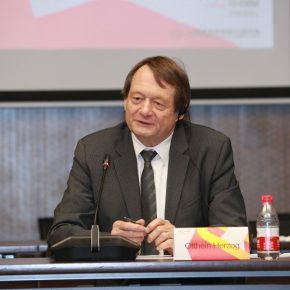 Fan Di’an, President of CAFA, mentioned during the opening ceremony that this seminar was indeed a product of cultural communication between China and Germany. The Digital Age means more efficient exchange of information, faster changes during the era, as well as greater influence on people’s daily life. Therefore, in this information age, people from different cultural backgrounds are brought together to understand each other better, and to come up with agreements and thinking that may resolve new challenges that people are facing. 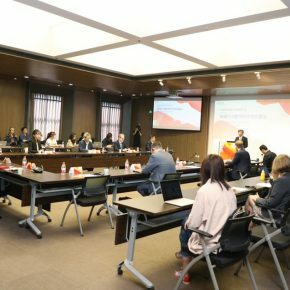 At this stage, China is trying to accelerate its process of digitalization, networking and technical intelligence, thus, how the developing urban cities and suburban areas could utilize digital technology to generate more vibrant and smart living space is a new issue that China is facing. 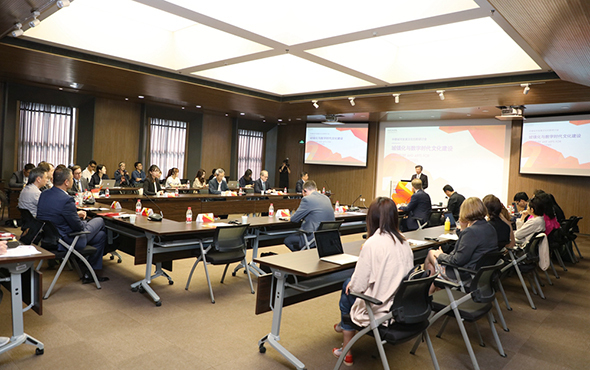 Just like many other global university education systems have done in response to the challenges brought by the new era, when it comes to the design of the layout and content of its academic disciplines, CAFA have begun many explorations around the topic of the digital age. For example, CAFA has attempted to link diverse art programs with digital technologies, and has achieved some successful results. 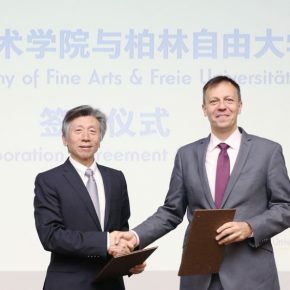 In recent years, CAFA has curated a series of exhibitions, including “China 8” and “Deutschland 8”, with its German colleagues. 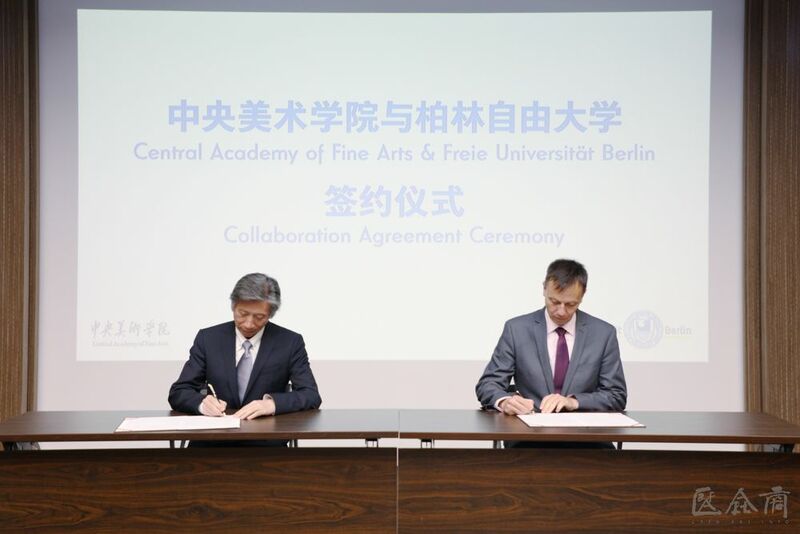 CAFA has also built a close relationship with many art institutes in Germany. 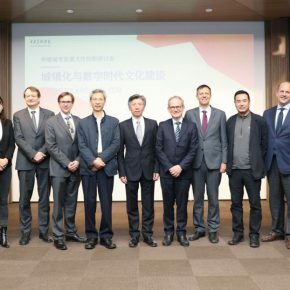 It is CAFA’s hope that, this seminar would foster further communication and enable substantial development between the art world in China and Germany. 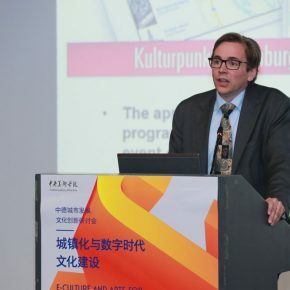 During the seminar, scholars from China and Germany delivered speeches and held discussions around a variety of topics, which focused on four aspects: “The Revolution of Urban Landscape and Cultural Construction”, “Public Education Service in the Digital Age”, “The Activation of Urban Cultural Heritage by Digital Technologies”, and “The New Challenges under Digitalization and Urbanization”. 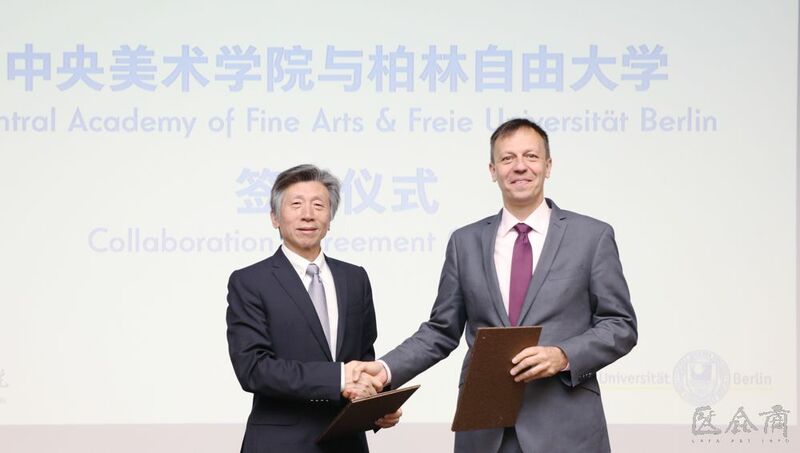 The signing ceremony of a cooperation agreement between Freie Universität Berlin and CAFA was also held during the seminar. 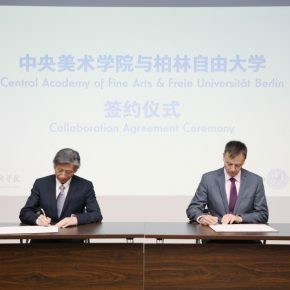 Prof. Dr. Klaus Muehlhahn, the vice president of Freie Universität Berlin, and Fan Di’an, the Director of CAFA, together signed a framework agreement to cooperate in the future. Dirk Petrat, Central Services, Ministry of Culture, Hamburg in Germany, proposed a concept of “digital culture cloud service” during his presentation “Infrastructure Facilitates Cultural Digitalization.” He argued that the digital culture could service to connect citizens, tourists and private businesses together, so that the service ability for a city to be digitalized could be enhanced. Michael Ruprecht, the Curator of the Museum of Martin-Luther-Universität Halle-Wittenberg, proposed during his presentation “German Universities as a Factor for Urbanization” that, German universities have greatly influenced the process of urbanization by being the biggest motivation for city developments and innovations, they have also made the city become the producer and broadcaster of knowledge. 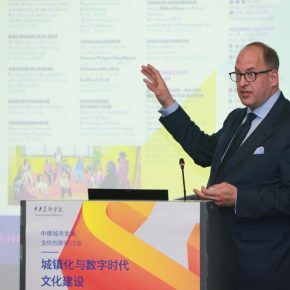 Börries v. Notz, the Director General of Foundation for Museum of Hamburg History, during his speech “The Digital Application in Museums”, proposed some extensive strategies that museums could be used to deal with digital transformation. 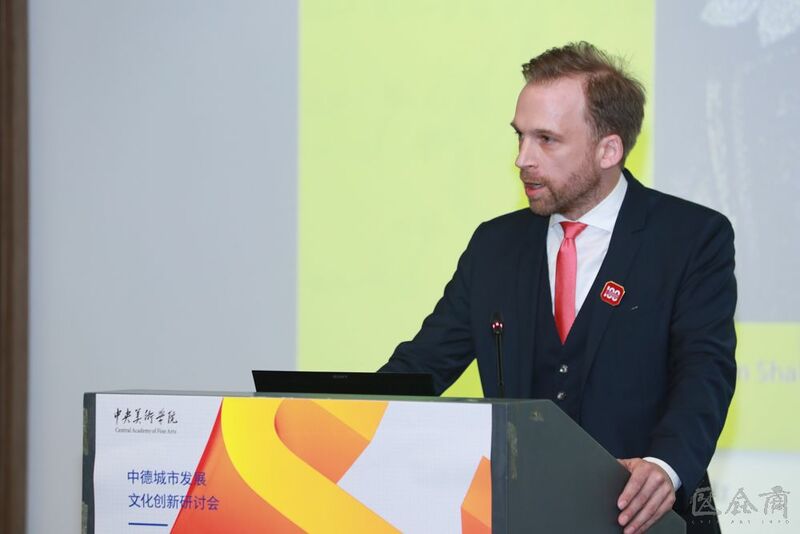 He argued that museums have become a provider of information, while museums have also taken the role of producing digital knowledge and broadcasting digital culture. 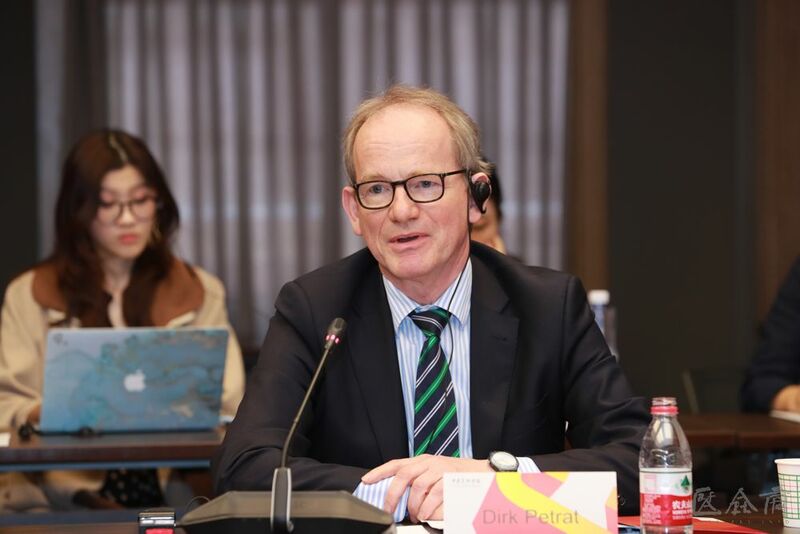 Therefore, there tends to be a need to build a portal for digital culture, to provide more opportunities for history and cultural researchers, scholars, tourists and citizens. Nevertheless, the digitalization of traditional history and culture is quite challenging, as digitalization means a change in the way that the content is being presented, which requires adaptation from museums and related cultural institutions. 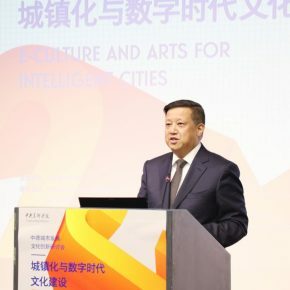 Wang Zhong, the Director of the Department of Urban Design at CAFA, mentioned during his speech “Art Leads Urban Innovation Development” that, the urbanization of Chinese cities has welcomed a new period for transformation since the 40-year Chinese economic reform. 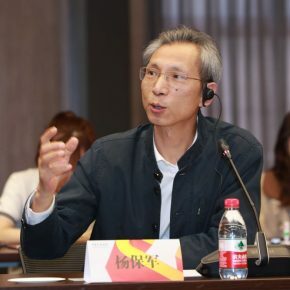 Wang argued that, the urban development in China has shifted from “quantity” to “quality”, from “function comes first” to “humanistic culture construction”, and its center has also shifted from economy to culture. During this process, public art not only significantly transformed the city’s landscape, but also added an aesthetic function to the city. 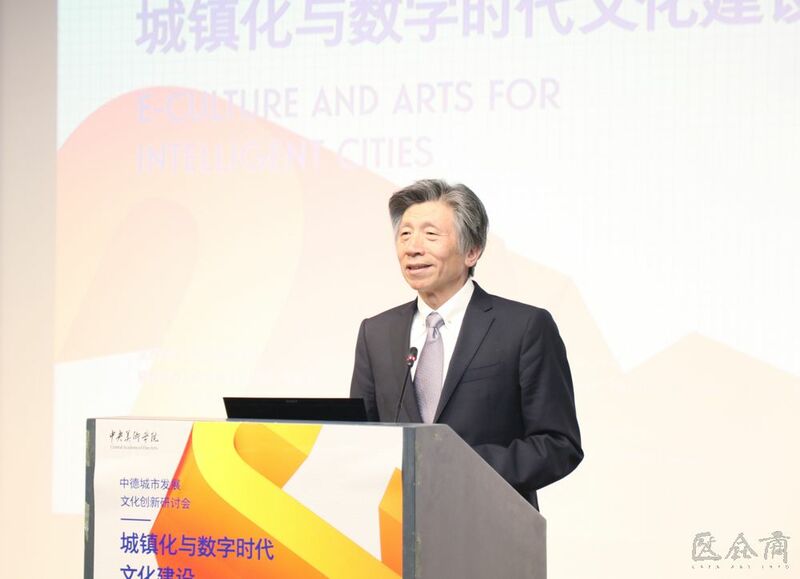 Wang Zhong’s concept of “Art Leads Urban Design” (AUD) calls for artists, city planners and architects to collaboratively work towards building a “soft” city with a cultural centre. 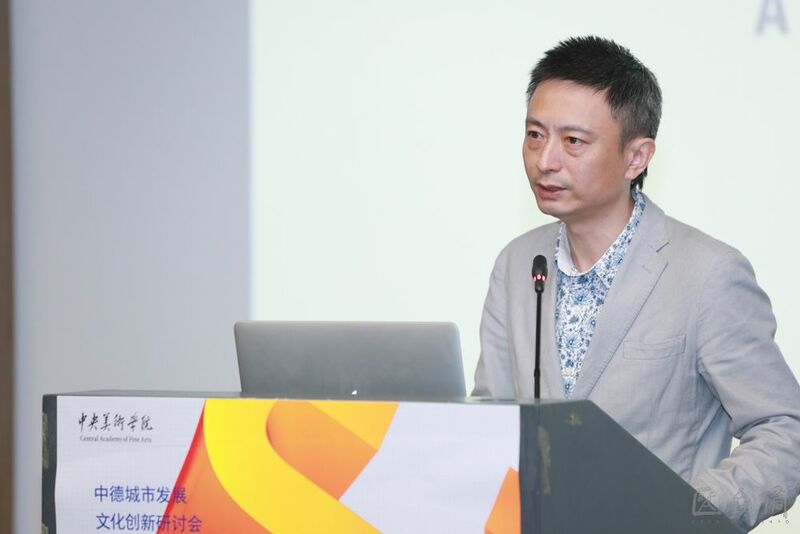 Chang Zhigang, the Vice Director of the Department of Architecture at CAFA, claimed during his presentation “The Making of Media Architecture and Site Digitalization” that, city plays a role in bringing different social groups together, and producing communication that accelerates human civilization and innovation. During the process of urban development, architecture carries both utility and aesthetic functions. Therefore, the architectural space in the 21st century cities have developed a fifth dimension from the original third and forth dimension, namely, the “media architecture”. The purpose of “media architecture” is to not only construct a beautiful city skyline, but also promote the communication and interaction among people. 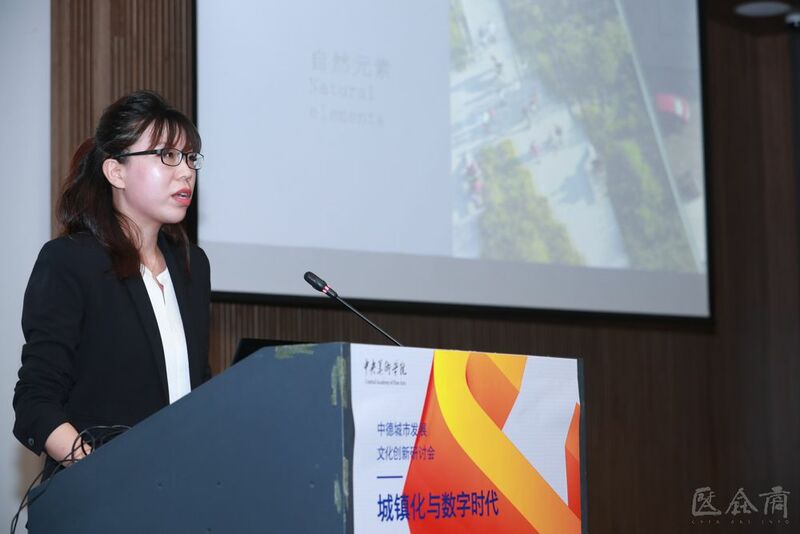 Liu Chang, the researcher at China Academy of Urban Planning & Design, during her speech “Perceiving the City: Human Senses and Cultural cities”, reviewed the original issue of the relationship between people and the exterior world, which is the issue of perception. 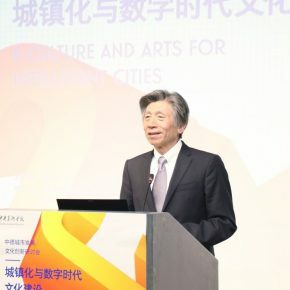 From the four aspects of perception, seeing, hearing, touch and smell, Liu analyzed the social and cultural functions in the city elements such as light, sound, and artworks. 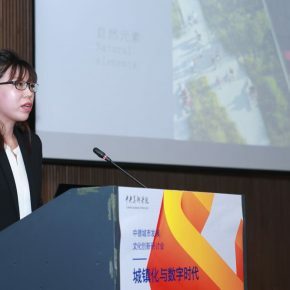 She argued that, to solve the problem of losing city characteristics during the process of urbanization in China, we would have to thoroughly implement the spirit of humanism. 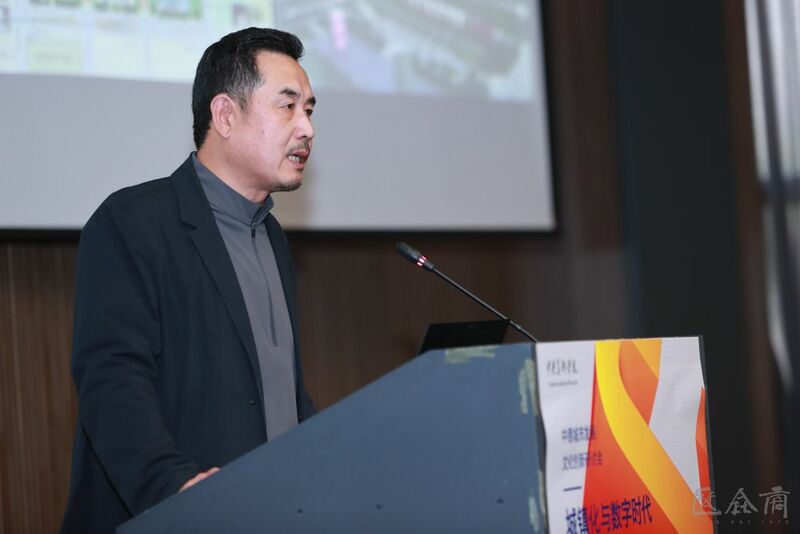 Fei Jun, the Head of the Digital Media Studio at CAFA’s department of Design, during his presentation “The Digital Representation of Cultural Heritage”, mentioned a series of practices including “Digitalizing the Imperial Palace”. He proposed that the main problem about the traditional cultural exhibitions in museums is the inactive relationship between the objects displayed and their spectators. And digital technologies can enhance the ability of cultural heritage to interact with the public, in some ways the inactive relationship could be transformed into an interactive one. Furthermore, digital technologies not only make the information more accessible, but also extract new values out of the objects. Fei Jun was also hoping that, by completing a system of digital Chinese cultural geography, it could take the culture in which the historical stories took place back to where it all started. Under the support of digital technologies, the city itself could even become a gigantic museum. 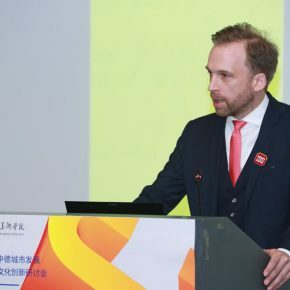 Dirk Börnsen, the Legal supervisor of Hamburg City Department of Cultural Affairs and the Head of the Department of Human Resources and Information Centre, introduced some digital applications that the city of Hamburg has used in its cultural administration. Through these applications, the information of different museums, libraries, theatres and cinemas is integrated as a whole system, so that it has become much more efficient when the government tries to introduce the cultural life of Hamburg to the public. Also, the digital technologies activate and reproduce the archives and materials stored in the Archives Bureau and different academic institutes, which have long been untouched by the public. Overall, digitalization has generated an important medium for people to learn the history and culture of a city. Besides sharing the products of the urbanization process and digital technologies, the participant scholars all agreed that there have been new issues and challenges brought by urbanization and digitalization. 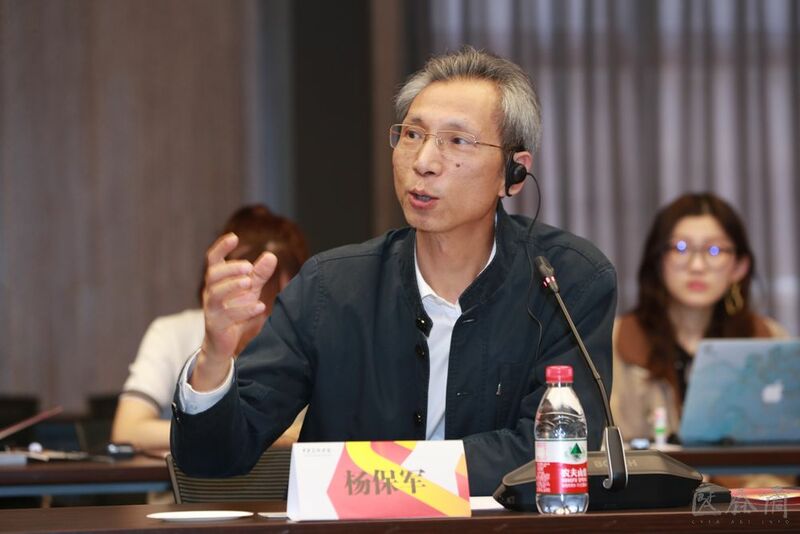 Yang Baojun, the director of China Academy of Urban Planning & Design, argued that, the two main tasks for the urban planners and designers are to improve the existing living environment and to create a better place to live. 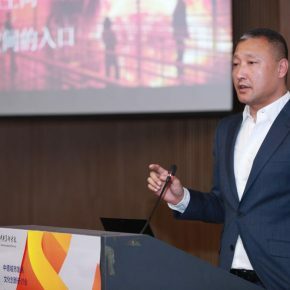 Yang also argued that, since cultural development is an essential part of a city’s development, we should encourage more interdisciplinary cooperation, so that more people could stand together to deal with the challenges brought by urbanization. 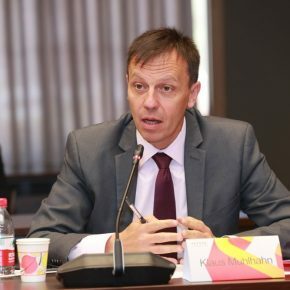 Klaus Muhlhahn, the Vice President of Martin-Luther-Universität Halle-Wittenberg, made the point that, technology is a “double-edged sword”, thus both academic institutes and scholars should carefully review these technologies, and be fully aware of the consequences that these technologies may bring. Only by doing so, could the students and public critically learn and use these technologies. Meanwhile, we must ensure that our residents’ life is not disconnected with the natural environment. Klaus Muhlhahn warned that, we need to first realize what challenges could digitalizing the city bring, then we can think of solutions. 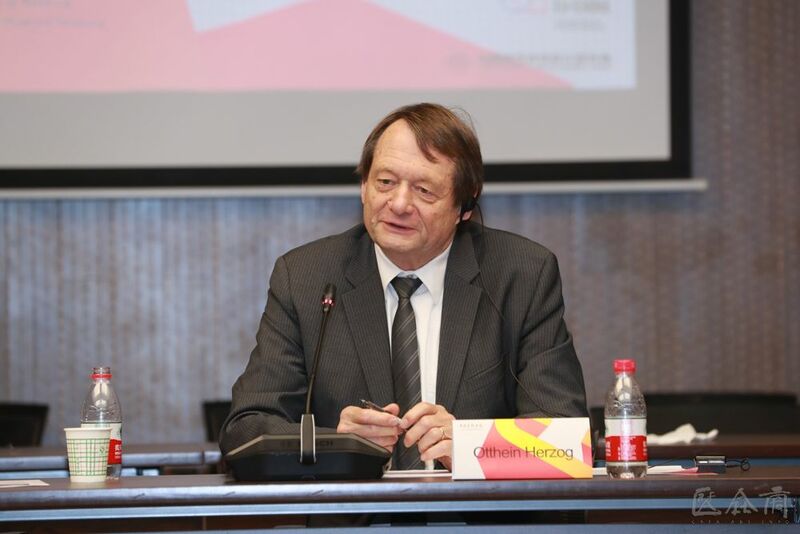 Otthein Herzog, the academician at Germany Academy of Science and Engineering, pointed out that, to make one fall in love with a city, we must take good care of one’s sentimental need, and build an emotional connection between the people and the city. Art education museums and the artworks in the city can play an important role to extend the dimension of emotion to our citizens. It would be great if we could utilize our current technologies to realize that. 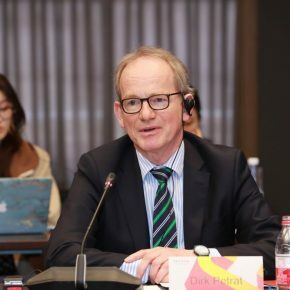 President Fan Di’an concluded the seminar by stating that, the experts and scholars from China and Germany have proposed some common topics from different perspectives and they have also provided us with many methods for practice. This suggests that we could go beyond the difference of cultures and form our own common pursuit. 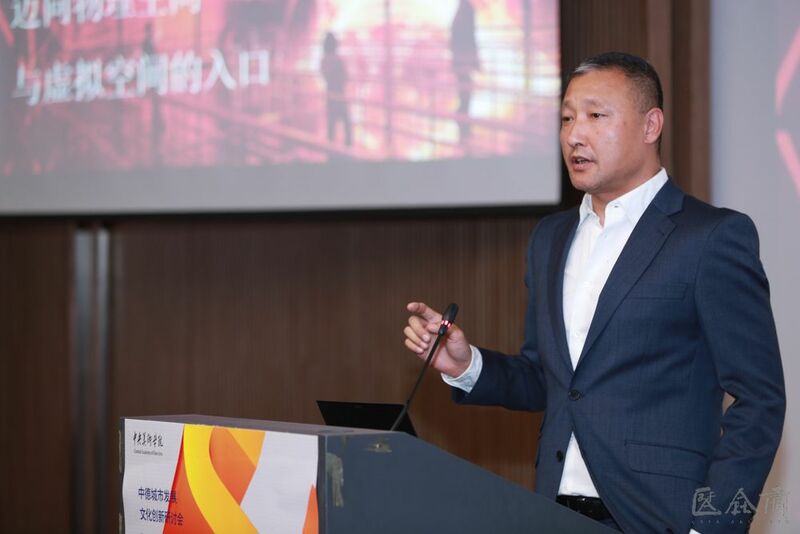 During the rapid economic and urban development in China, digital technologies could connect culture and cities together with significant value and potential. And CAFA is a comprehensive art university that combines fine arts, design, architecture and art & humanities subjects. Therefore, we believe that CAFA can handle the competition, interactions, and promotion among diverse subjects during future social developments. On the one hand, our exploration of urbanization and digital culture connects with the present, on the other hand, it also connects with history. Attention to art and humanities is what essentially motivates us to work, it is also our value goal.